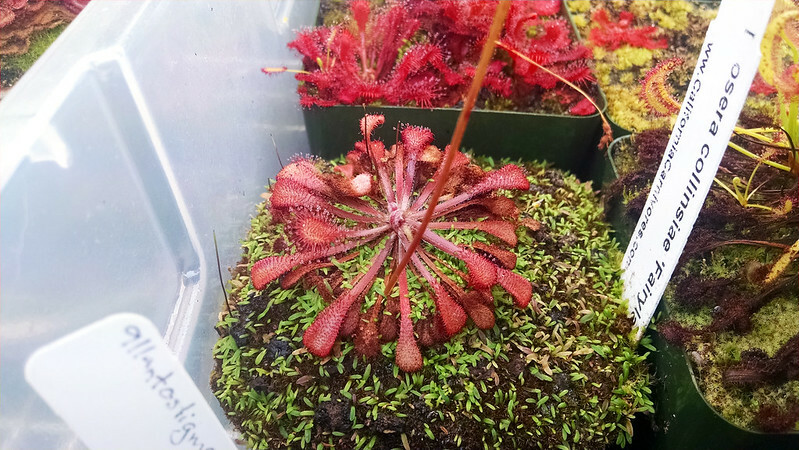 Response to Take Down Garden Spray |Sundews Etc. As you may remember, I've been using Take Down Garden Spray on my collection recently to combat aphids. The active ingredients are pyrethrin and canola oil, so it's pretty gentle stuff. Still, some plants have reacted better than others. Drosera collinsiae and Drosera ×snyderi have definitely not appreciated the applications. Don't look so down buddy. Fried! Frazzled! An unhappy plant. A handful of other plants have had a similar, but less severe, reaction. I'm using a 2% solution right now, and this is after I applied it twice in 5 days, and then didn't apply for a week. To be fair though, these two plants were both slow to settle into my conditions, and have both seemed a bit on the fragile side. 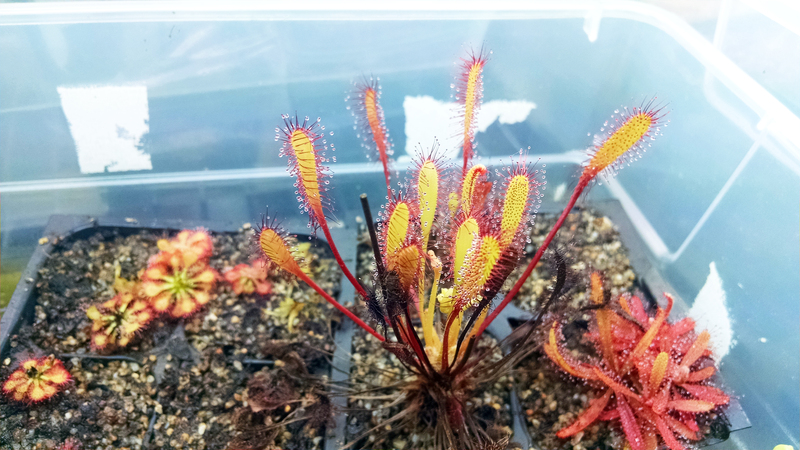 Other plants, like Drosera anglica CA × HI, have totally taken the spraying in stride. I know I can always count on this guy to do well. It's even blooming again! It bears repeating that this is one of the most vigorous plants in my collection as well. 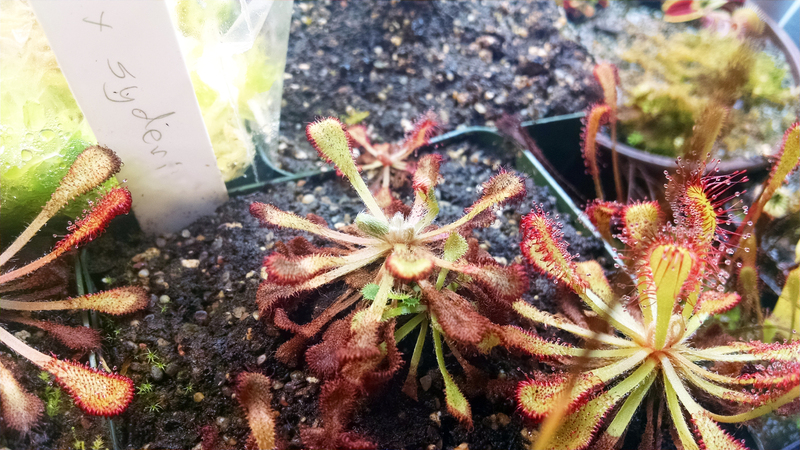 It just seems like the finicky plants are going to be finicky, and the robust plants won't mind (my Drosera adelae has also been fine, for example). It's not a surprising finding, but it's good to know. 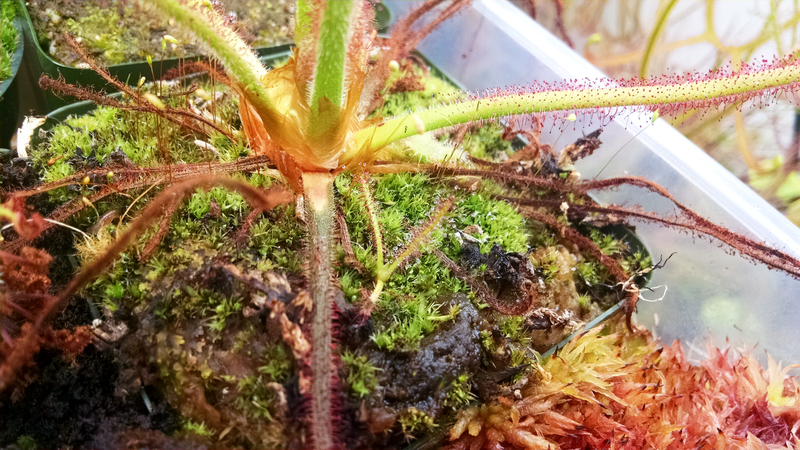 On a related note, my Drosera spiralis is definitely not phased. Not only is it flowering again, but it's put out an offset for the first time! Look at those cute little baby leaves. I'm really inordinately fond of this species. It just does so well for me, and gives me all sort of nice surprises. Looking forward to the little guy growing up a bit. Of course, none of this has addressed whether or not the aphids are being beaten back. Well, I think they are? I hope they are? I'll need to apply a few more times before I make a solid decision. However, I am considering going systemic pretty soon. My patience is wearing thin. We'll see!